Oh yeah, and the new Halloween trailer came out today. I shall reserve my judgement until I see the final product. But……I am fairly impressed with what I have seen so far. Not as impressed as I was, and always will be, with Ben Tramer’s drunken stooper before he got the life snatched out of him by that cop car though. RIP. I’m not even going to bother lying. I want that thing. Do I want it for $50 though? Therein lies the question going through my mind as I type this. Regardless of the price, it’s kind of a cool piece of 80’s horror history – and something that you could proudly display as well. It measures about 8″ X 5″ and looks to be in overall good condition. 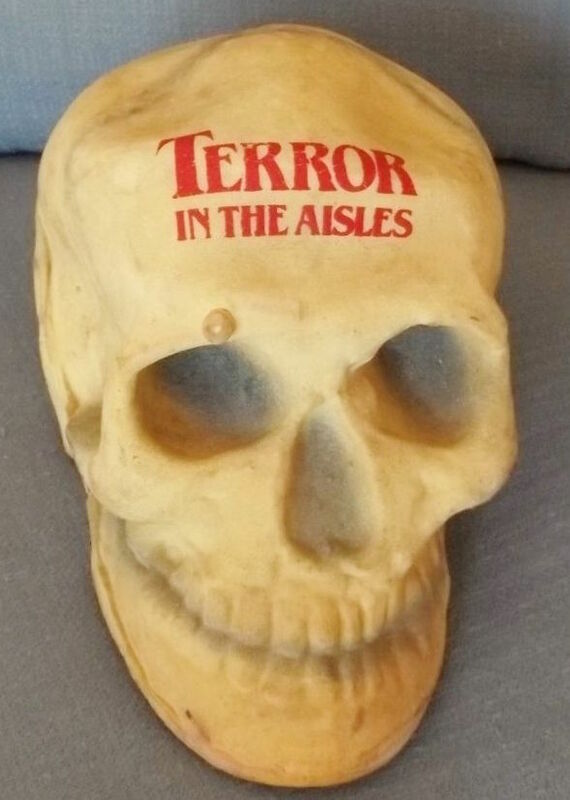 If you are interested in knowing more about this promotional rubber skull from Terror In The Aisles, then head on over HERE. If you haven’t seen the movie btw, I recommend it because it’s a good time and you get to see Donald Pleasance!